The old school vibe of Quentin Tarantino’s latest wild west movie doesn’t just extend to the director’s trademark styles or its setting—it extends to the merchandise, too. Fluffy, oversized coats for everyone! 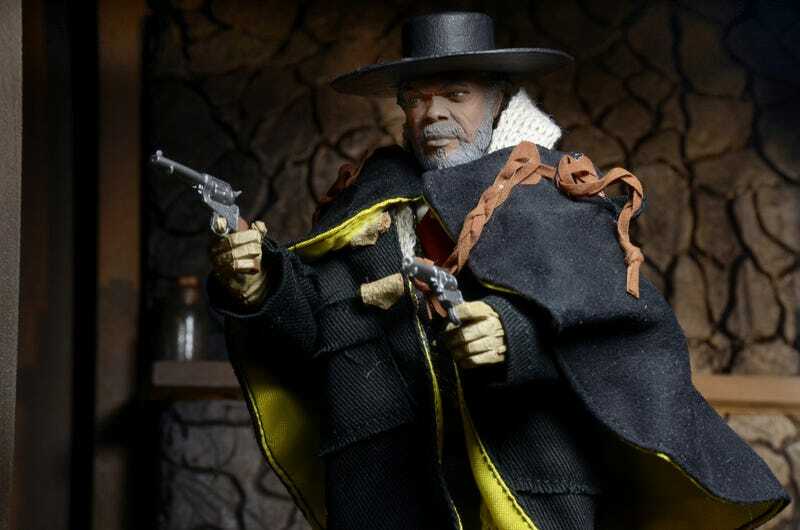 NECA have fully unveiled the line of Mego-inspired dolls based on The Hateful Eight all based on the titular eight main characters from the film. Each figure comes with a handful of accessories, from knives to guns to more guns, and fully tailored cloth outfits that, in true classic 7-inch Mego doll style, are often hilariously oversized for their tiny frames. It sort of worked back in the days of Mego’s height, when everything was much simpler, but here with ultra detailed clothing of modern toy design, it just looks a bit goofy. There’s more coat than Sam Jackson in that figure, I swear to god. If you’ve got a fondness for the old Mego style, and were a fan of Tarantino’s latest, you’ll probably want to jump on these fast—NECA will only produce one run of the toys, limited to 3,000 per character. They’ll set you back around $30/£21 each when they release in March.